I have to admit, beside my addiction to miniatures I'm also a true chocolate lover :) So how about sculpting a Chocolate Cake? When our Pumpkin Crew planned a big barbecue for Coloristo's/Oli's birthday I took the chance to bake THE chocolate cake of all chocolate cakes. 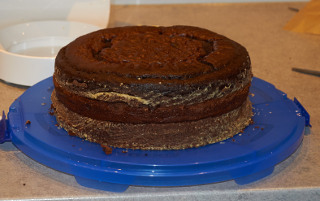 It consists of two layers of chocolate cake (I would say it is a kind of sponge cake) with a hint of espesso flavor, a layer of chocolate cheese cake and, I think you can already guess ;), a super chocolate sour cream frosting. 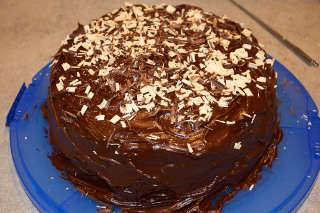 And if you still need some extra chocolate, just add chocolate shavings on top! It's not very difficult, so go try it yourself! 1. Preheat the oven to 160° C.
2. Prepare the Chocolate Cheese Cake: you need a round baking pan, baking paper and melted butter. Just put the paper on the bottom of the pan and paint the inner sides with butter. Next melt the chocolate in a microwave. I used a little bit butter with the chocolate so it doesn't burn. Fill the batter in the pan and bake it for 30-45 minutes until the surface is solid when you touch it. Now let it cool off. When it is cool enough put it in the freezer until the rest of the cake is ready. Don't turn off the oven! You'll need it for the chocolate cake. 3. Prepare the Chocolate Cake: Again you need one or two round baking pans of the same size as the first one. I used one and splited the cake in halfs after baking them. You can also use two pans and divide the batter in halfs. First you have to paint the whole inner pan with melted butter. Afterwards put some flour into the pan and spread it all over the it until the whole pan is covered with flour. Next mix all the ingredients except the buttermilk. At first add just 1/5 of the whole amount of buttermilk. After the batter is smoothly mixed, add the remaining buttermilk and mix it with high speed for about 30 seconds. Put the batter in the pan and bake it for 30-35 minutes. Stick a toothpick in it and if there is no batter on it the cake is ready! Finally, if you used just one pan like me, take a thread and arrange it around the middle of your cake. If you're satisfied with the position, cross the ends of the thread and pull them together until it cuts through the cake. Now you have two halfs! 4. Prepare the Frosting: Again melt the chocolate with some butter in the microwave. Add soure cream and syrup and mix it. Now put the frosting in the fridge for about 30 minutes. The frosting should be sticky and firm. 5. Grand Finale! 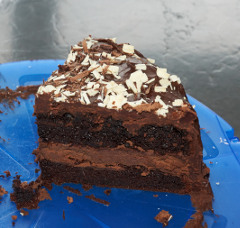 Separate the two chocolate cake halfs. Put the chocolate cheese cake on top of the first half. When it fits nicely place the second half on top of the chocolate cheese cake. Now take the frosting and a dough scraper. Spread the frosting upon the cake and the side of it. It doesn't have to be smooth, I really like the rough surface! If you want to add some extra chocolate, put a black and a white chocolate bar in the microwave for a few seconds (really short! About 5-10 seconds.). Now take a knife and pretend to remove mold lines from e chocolate bars. Tata! Chocolate shavings! I will give that a try too!